Kids, this is huge. No, it's massive. This is the best servo controller value available. 32 channels of 1uS resolution servo control. Bidirectional communication with Query commands. Synchronized, or "Group" moves. 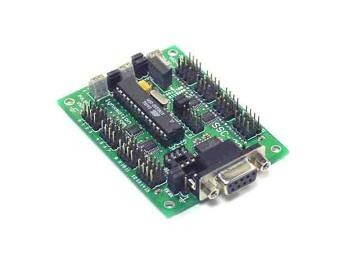 12 Servo Hexapod Gait Sequencer built in. MiniSSC-II emulation, like having 4 of them. Plus much more! The much more includes, "The motion control can be immediate response, speed controlled, timed motion, or a combination. A unique "Group Move" allows any combination of servos to begin and end motion at the same time, even if the servos have to move different distances. This is a very powerful feature for creating complex walking gaits for multi servo walking robots. The servo's position or movement can be Queried to provide feedback to the host computer. Any output can be used as a TTL level output. There are 4 inputs that are static or latched, so you don't have to worry about missing a short event." And it's even comes assembled. 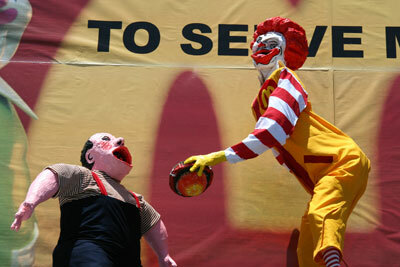 The Billboard Liberation Front just pulled a prank that included an animatronic Ronald McDonald...from what I have read it was their first billboard liberation to include an animated figure. Let's hope it's not the last.